Creating a niche of Relief Tents such as Relief Tents Single Fly, Relief Tents Double Fly and Bell Relief Tents at its best, with utmost quality. Our organization is one of the counted names as one of the leading manufacturers and suppliers of Double Fly Relief Tents. These portable houses are used in public gatherings. Offered tents are appreciated for their durability and good tensile strength. The offered tents can be used during medical or relief camps. In order to meet the various demands of the clients, we offer these tents in different sizes and colors. We offer Single Fly Relief Tents at affordable prices. These are portable houses used in public gatherings. Our professionals manufacture these tents from the finest quality raw materials, with the incorporation of advanced machines. 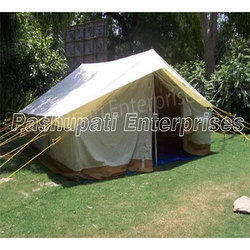 Offered tents are cost effective and widely demanded by our clients. Easy to assemble and disassemble, the offered tents are used during camping for staying purposes.